I’m thrilled to be sharing an anthology with a group of 18 other very talented writers. As I mentioned a couple of days ago, we’re doing a blog tour as part of the Equus release this month. Today I’m pleased to host a guest post by Chadwick Ginther. This story wasn’t supposed to exist. Norse myth is always one of my go-to inspirations (so much so, that fellow Equus contributor, Cat McDonald threatened an intervention (To be fair: Cat threatens me a lot. She is my self-declared nemesis, after all.)). Going Norse also meant I’d have a chance to play in the world of my Thunder Road series again and it would cut down on the amount of worldbuilding I’d need to figure out so I could concentrate on character and plot. I immediately decided on a descendent of Sleipnir, Odin’s eight-legged horse, who could run over air and water as fast as over solid ground. In addition to being Odin’s mount, Sleipnir was also a son of Loki from when the trickster had disguised himself as a mare to win a bet (Loki gets involved in…interesting bets). The joy of featuring a descendent of Loki, was that Loki could play a part in my story too. Loki is one of my favourite characters to write, and just as Tom Hiddleston’s version in the Thor movies outshines the thunder god, my Loki is arguably more popular with my readers than Ted Callan, the hero of my novels. Sleipnir’s offspring don’t get a lot of mention other than Odin’s valkyries using them as mounts. As far as I could find, there wasn’t a specific name for the valkyrie’s mounts, which, as well as giving me potential antagonists, also allowed a lot of freedom to play around. I wanted my equine to be human—or at least, she’d been living a human life, unaware of her heritage, or weird relations—until she, and the reader, enter the story. She would be a shapeshifter (because Loki) and would be able to run on air (because Sleipnir) but I still had no idea what to call her kind. I decided not to go with the -sson/dottir suffix after their ancestor’s name for my flying shapeshifting horses because it felt a little too on the nose. After toying around with what to call them (long after the draft was done, and almost long enough to miss the submission deadline) I settled on wind foals—which also gave me the elements of my title. I found an approximation of wind foals in Icelandic (literally the last thing I typed into the manuscript before I hit send) and despite knowing it was wrong (or at least, not entirely correct) I crossed my fingers and submitted the story. I was thrilled when Rhonda said she wanted to include “Scatter the Foals to the Wind” in Equus but the sale raised a new problem: I had to get that damned name right. Fortunately, my Thunder Road copy editor speaks Icelandic and went above and beyond, and so the Vindafolöld were born, and free to fly onto the shelves. Chadwick Ginther is the Prix Aurora Award nominated author of the Thunder Road Trilogy (Ravenstone Books) and Graveyard Mind (forthcoming from ChiZine Publications). Other than Equus, his short fiction has appeared recently in Tesseracts Nineteen: Superhero Universe, Those Who Make Us: Canadian Creature, Myth, and Monster Stories and Grimdark Magazine. He lives and writes in Winnipeg, Canada, spinning sagas set in the wild spaces of Canada’s western wilderness where surely monsters must exist. 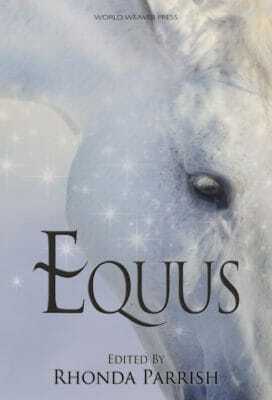 Equus, fantasy, guest posts, Rhonda Parrish. Bookmark. I love the name you settled on! Curious to see whether the wind foals are as graceful and poetic as their name sounds. Given their descent from Loki, I somehow doubt it!